When Will the FDA Appprove Andoxal? I get questions from time to time on The Peak Testosterone Forum as to when Androxal will be finally approved by the FDA. 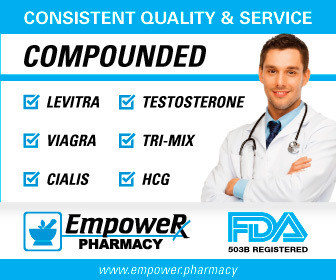 Androxal is something many men are looking forward to, because it is the "new and improved Clomid" of Repros Pharmaceuticals that is composed of only the more male-friendly isomer (of Clomid) called enclomiphene. It is targeting overweight men who want to raise testosterone and preserve fertility, but will be used by many hypogonadal younger men who want to preserve their hypothalmic and pituitary function. Clomid, in men, often produces many estrogenic side effects (moodiness, loss of libido, etc.) due to the other isomer of Clomid (zuclomiphene). 1. Successfully completion of all phase III trials. 2. The submittal of an NDA (New Drug Application) in Feb. of 2014. At this point Repros Pharmaceuticals is just waiting to hear from the FDA if the drug will be approved or not. The new should be favorable in my opinion, because a) Androxal did well in Phase III trials and b) the stock price has held up quite well since the NDA: the stock peaked at about $9.85 in February, then fell a little and came back to $8.53 as of this writing in August of 2015. So investors and instititions still clearly believe the Androxal situation looks favorable. i) Longer. I think it is reasonable to assume that it will be on the longer side rather than shorter, i.e. in the 8-10 month range. And the reason is simply that there has been a good deal of controversy of late centering around testosterone-related products. Last year, there was a a wave of litigation that arose against the big pharmaceutical testosterone manufacturers, something I cover in the page called Testosterone Pharmaceutical Class Action Lawsuits after a couple of studies that showed increased cardiovascular risk for men on HRT. ii) Shorter. Recently Aveed (Nebido) did an NDA application in September of 2013 and was approved by the FDA in March. This shorter six month approval time was suprising considering the reports of a couple of anaphalytic shock victims and the procedures necessary to comfort the FDA, etc. One cold argue that Androxal's approval should actually be easier than Aveed. CONCLUSION: The optimistic time for FDA approval is September of 2015 and the pessimistic December of 2015. NOTE: A potential issue with Androxal is that it may not provide much of a T boost. See my page on Testosterone and Androxal for more information.